Nuremberg — Nuremberg is the birthplace of Queen Victoria’s beloved prince Albert. Its Altstadt (Old Town) has maintained its ancient random layout of streets, making it best explored on foot. There you’ll find the great Lorenzkirche, with its 66-foot tall tabernacle and magnificent Veit Stoss woodcarving of the Annunciation. View Nuremberg’s classic red roofs and city walls from the Imperial Kaiser Castle. Get a taste of German toy making at the Toy Museum. Not for nothing is it on the German Toy Road. The Nationalmuseum displays works by Nuremberg’s greatest Renaissance artist, Albrecht Dürer. Satisfy your sweet tooth by sampling the Lebkuchen at its Christmas Market, the largest and oldest in Germany. As you travel from Nuremberg to Bayreuth, you’ll pass through Franconian Switzerland (Fränkische Schweiz), an upland region named for its resemblance to Switzerland, and regarded as the birthplace of freeclimbing. In addition to its more than one thousand limestone crags and seven thousand climbing routes, “Little Switzerland” offers splendid kayaking, canoeing, and cave-exploring opportunities. Franconian Switzerland, square kilometer for square kilometer, has more private breweries than any other region of the world. Enjoy some of the local beers in the town of Pottenstein, where you can visit the impressive Teufelshöhle (Devil’s Cave). Then continue on to Bayreuth, and witness the Aktien Brewery maturing their beer in 400-year old catacombs. Bayreuth is also the setting for both Germany’s annual Wagner Festival and the Opera House Richard Wagner himself constructed in 1876. An even more important site for opera fans, however, is the city’s remarkable baroque Galli-Bibiena-designed Margravial Opera House. Margravine Wilhelmine, for whom the Opera House is named, said of the Sanspareil Rock Garden set among rock formations in a grove of beech trees standing along the road between Bayreuth and Bamberg, “Nature herself is the architect.” The Garden’s Oriental Building, built in 1744, is one of its three original structures still standing. If the Aktien Brewery catacombs made you hungry, try some Franconian sausages! On the road between Bayreuth and Bamberg lies Coburg, the best place to dine on regional sausages. Coburg’s Marketplace, where the sausages are grilled over pinecones in the open air every day of the year, is the best place to get them. Witnessing your meal in the square will be “Sausage Man,” the Marketplace’s statue of Coburg’s patron saint, Saint Maurice. Also take in the Veste Coburg, a 13th-century fortress above the city, in which Martin Luther took refuge during the year of 1330. 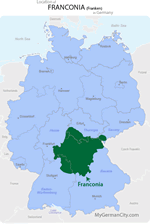 I’ve barely mentioned the hundreds of excellent Franconia wineries, which deserve much better. I simply think you’ll be inebriated enough by this wonderful region’s other charms!